IT'S ALL ABOUT THE WATER! This 3BR/2BA ranch on Lake Hartwell has exceptional water views and deep water. Open floor plan and vaulted ceiling. Great room has a fireplace, hardwood floors and french doors that open to a large screen porch. Beyond the porch a huge lakeside deck overlooks a close Corp line and covered slip dock with 60' gang walk. Welcome to the Lake! Bring on your friends and family and enjoy this beautifully renovated home. Built in 2005 but recently renovated you will appreciate the immaculate condition. The front yard is nice and level with plenty of parking room. A foyer entry leads to the two story great room with a wall of windows so you never forget you are at the lake and in the woods. Lake Hartwell life is at your fingertips! Custom home built on an exceptional lot, close corp line, easy short walk to the deep water (seller reports 28ft) dock. Beautiful 5 Bedroom home with 3 1/2 Bathrooms in the foothills of the mountains and on the lake. 2 Story Great Room with Fireplace and plenty of seating. Updated Kitchen and Bathrooms with granite countertops and tile floors. This great Lake Hartwell home would make a perfect vacation home, but also has everything you might need for full time living. The great room with soaring ceilings and wood flooring has a wall of windows overlooking the lake and is adjacent to the dining area and granite kitchen. The dining area opens onto a screened porch and an open grill deck. Yes, you can have it all.....a gorgeous home situated on a 1.3 acre lot with a covered slip dock on Lake Hartwell. Built in 2008 and used as a second home it still feels like brand new! The craftsman style home has a beautiful entry & two story foyer. Two Family designed home on Lake Hartwell in Windsor Shores, Martin area of Stephens County. Spacious rooms throughout and lots of storage and closets plus a 3 car garage. Home sits on a corner open lot with boat storage carport and grassy level walk down to the lake with covered boat dock in place. Everything you want and more! Beautifully renovated home on gorgeous Lake Hartwell. This unique property features luxury updates with the comfortable feel of a lake retreat. Wouldn't be nice to have a weekend get away that you can sneak off to every weekend to relax and forget about the hustle and bustle of the work week! Well here it is...This 2 bedroom 1 bath mobile located on Lake Hartwell in the foothills of the Appalachian Mountains. House features large screened in porch overlooking the lake. Updated stainless steel appliances with gas stove top. Now this is the ideal little lake cottage. FURNISHED! Cozy and quaint with hardwood floors, fireplace, open dining/living area, grilling deck and more. Over sized bonus room to back of house ideal for extra sleeping space, play area, etc.. Privately situated on .53 acre with a path that takes you down to a covered slip dock with boat lift. 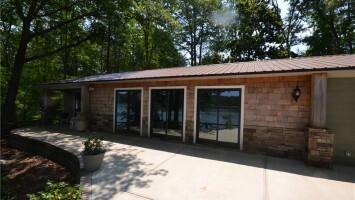 Lake Hartwell WATERFRONT home with COVERED SLIP DOCK in place. The first thing you notice about his home is the welcoming, rocking chair front porch. This cozy home features 3 bedrooms, and 2.5 bathrooms. Home has been tastefully renovated with wood laminate flooring and neutral carpeting. Home has an open floor plan with living and dining combination. Point lots are rare at Lake Hartwell. Most of those point lots have build sites with vast treed corps property between the home and the lake, greatly restricting the view. 131 Malibu offers a 4 bedroom home sitting directly on the peninsula, with the water's edge only steps away. This site offers a 270 degree, open, panoramic view of the main channel of the lake.